The depths of mankind’s last unknown frontiers – outer space and a grieving heart – are explored in this brave and funny new play about a woman’s solo journey to Mars. In 2010, a bill was signed in the United States authorizing manned missions to the planet Mars by 2030s. But, the reality of such a trip comes with a catch – such a flight would take over eight months, would be performed solo and would offer no return trip. Outstanding Premier Production, *Outstanding Solo Performance, Outstanding Full Length Script, *Outstanding Sound Design. Read James McLane’s proposal of a one way trip to Mars. Mars-One is actually planning to send people to Mars with no return and to fund the project by broadcasting the voyage as reality TV. Reddit posted this question: If given a one-way ticket to Mars, would you do it? 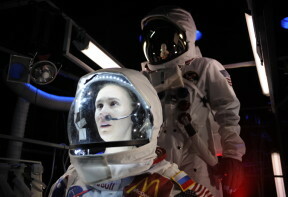 If you are interested in bringing Spaceman to your theatre then contact us!